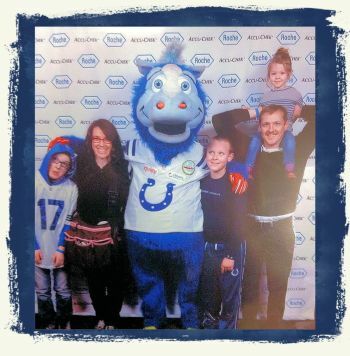 “Awesome night at Lucas Oil Stadium connecting great families and professionals fighting diabetes,” said Malissa. Pictured: Garrison Family – Malissa, Dave, Clayton (10 years with T1D) and siblings. On January 13, Will’s Way, along with JDRF, American Diabetes Association and the Diabetes Youth Foundation of Indiana , were invited by Roche Diagnostics Corporation to participate in its Family Fun Day at Lucas Oil Stadium. Seeking to bring a smile to the faces of 50 families who live with type 1 diabetes 24 hours a day, Roche hosted an event where its employees could visit with children suffering from type 1 diabetes and their families. The children and families were encouraged to run through the Indianapolis’ Colts tunnel and onto the field where they participated in numerous activities such as punting, passing, corn hole, posing for a caricature artist and of course, pictures with Blue, the Colts mascot. Afterwards, the families were given the special treat of touring the locker rooms, training rooms and press box. 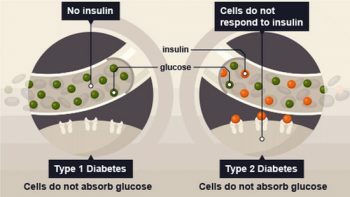 “Diabetes is a disease we all hate that doesn’t have many fun days. But today, oh today! Thank you to the people at Roche, we got to be completely spoiled for two hours,” said Brooke Wilson, mother of 10-year-old-type-1-diabetic, Jaden Wilson. The Will’s Way staff helped Roche put faces and names to the consumers they help. We are thankful to them and other companies like them who care about the communities they serve. The leadership team at Roche wanted to add a personal side to their training week. We think they succeeded! 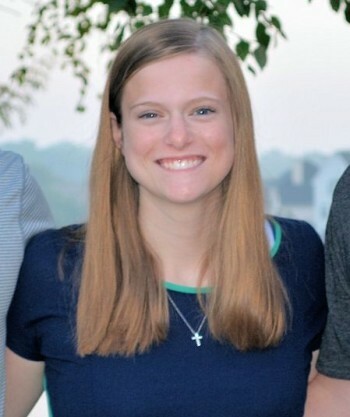 “As a parent, I would say seeing so many faces that work behind the scenes for the health and well-being for those living with type 1 was humbling. The Roche employees were genuinely involved and invested in making the afternoon a ‘once in a lifetime’ experience,” said Kaleesha Thompson, parent of participating child. The children and families who participated in Family Fun Day created memories that will last a lifetime. We won the day and type 1 diabetes lost. “It honestly made me feel really special,” said Philip Thompson, 15-year-old-type-1 –diabetic. On Tuesday, November 20, 2012 life in the Oberndorfer House drastically changed forever. At approximately 9am that morning, our youngest, Will, was diagnosed with type 1 diabetes. Nothing in our world would ever be the same. When I woke up the day after his diagnosis unable breathe because I felt so helpless in the face of this disease…I wish I knew that not only would T1D not defeat my son…he would learn to live a happy, active life. Yes, he needs lots of “behind the scenes” care but he is managing diabetes. Type 1 diabetes is NOT managing him. My child does not need me to fix every problem in his life. I cannot cure him of this disease. I want to…I yearn to cure him, but I simply cannot. But I can teach him how to live with grace and compassion. I can teach him that everyone has a story and no one has the right to judge another. Seek to understand, not to judge. The amount of people willing to support us and lift us up would take my breath away. We have been given so much on this journey; the support of our family, friends, co-workers, teammates and coaches has been key to our successful management of this disease. Faith…it is not just a word. Our faith in each other, in God, and in modern medicine allows us to accept this disease into our life. While I will never stop praying for a cure, I have faith that Will can continue to live a full and complete life while we wait. My son being diagnosed with a chronic, incurable disease would help me discover a new passion in my life…helping others beat this disease. By starting and running Will’s Way I have found a purpose in an awful diagnosis. Helping families get much needed life-style devices has given me so much joy. Again, I wish I would have known on that Tuesday type 1 diabetes would not defeat us, but I’m thankful I now know we will actively work to defeat it! Lastly, I wish I could have forseen what an amazing, capable person Will would turn out to be. I remember the scared and sick and newly diagnosed child…and it is hard to recognize him in the confident, healthy, compassionate young man he has become. He is a leader and an advocate. He is a young man of great faith and compassion. I can’t wait to see what the next 2 years will bring. Today, we celebrate. We celebrate what we previously feared. We celebrate 2 years of triumph. 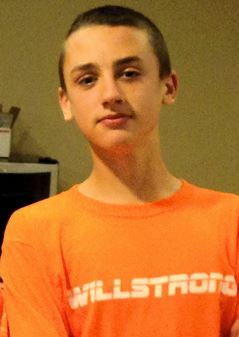 We celebrate Will and all the other type 1 diabetics who are THRIVING!